Texmaker 5.0, a new version of the crossplatform LaTeX editor for Windows, Mac OS X and Linux, has been released on July 17, 2017. The new version comes with a new interface, high DPI support for Texmaker on Windows and Linux, and other improvements. 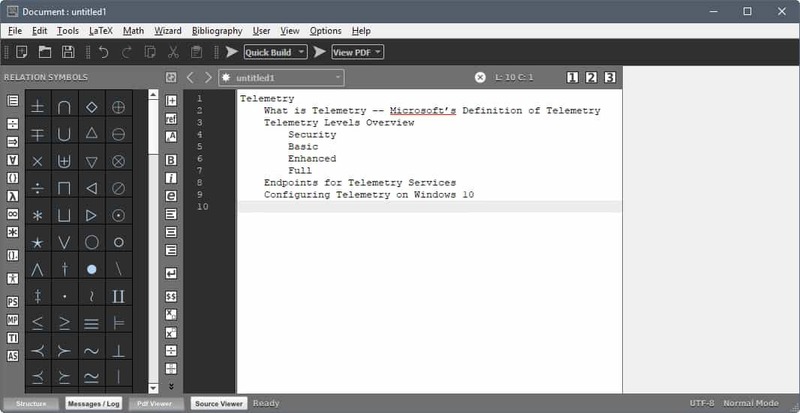 Windows and Linux users should not confuse Texmaker, a LaTeX editor, with TextMaker, a word processor that is developed by SoftMaker and part of the company's Office suite. The programs are not related in any way. Windows users can download a portable copy of Texmaker, or a version that gets installed on the device running Windows. Only Windows 8 and 10 are listed next to the downloads, but the changelog does not mention that support for Windows 7 or older versions of Windows has been dropped. Also, if you install the Windows version, you need to make sure you remove any previous version before you do so. Texmaker 5.0 is a powerful Tex application that you can customize to your liking. A good starting point for users new to Tex is the user manual that is available online on the project website, and integrated in the program under Help > User manual as well. Texmaker supports multiple formats, including PDf which it can load and display in its interface. The program features a spell checker, support for mathematical symbols, and code completion. Other features of interest include a quick build command, support for wizards to generate standard LaTeX code, error handling, and functionality such as find in folders. The interface looks crowded at first as you find lots of icons and panes displayed by default. You can use the buttons at the bottom left to show and hide certain panes. If you don't need the PDF viewer or the structure pane for instance, you can hide them so that you have more space fro the actual content. As far as changes are concerned, it is probably support for high DPI displays on Linux and Windows that is the most interesting of new features. While the interface appears to have changed in Texmaker 5.0, it appears that all the main features and functions are still displayed in the same location they were in before. All other changes of Texmaker 5.0 are updates to components. The program comes with a new PDF engine for instance, and requires use of Qt 5.7 or higher now. KDE5 users may be glad to hear that a spellchecking issue has been fixed in the latest release as well. Texmaker 5.0 is a powerful cross-platform LaTeX editor. The program has been around for a long time -- since 2003 -- and is still actively supported. Now You: Which text editor do you use predominantly, and why? With the installer version on Windows 7 I get: “This application is only supported on Windows 8 or higher”. … portable version is running! I first used Texmaker about 14 years ago and then lost the need to use it. The new version obviously is a huge improvement, but the default font still does not clearly distinguish Ii1 Ll1 Oo0 to my old eyes. Still keep a copy of Texmaker in case I need to open/edit several documents at once. I’ve had a similar experience, going from TeXnicCenter to TeXstudio and then deciding I didn’t need the fancier features. Nowadays I do just fine with Visual Studio Code + LaTeX Workshop extension. I can edit tex files like any other code file, but with all the other extensibility of VSCode available.